Your 1 - 100 Prediction Is Right On The Money! A soon-to-be-stunned spectator gives you a number from 1-100. You remove all the change from your pocket and the total matches exactly! In Greg's professional repertoire for years, it's a perfectly direct and deceptive feat of mentalism that has impressed some of the best minds in magic! It's easy to do. You start clean, end clean, can turn your pocket inside out or (if you're cheeky enough) have a spectator reach in for the outcome herself. Plus, it comes with 36 remarkable routines to overwhelm your senses! Resets instantly. No palming. No forcing. No tailoring. No place it can't be done. The instructional DVD, fine leather money clip and custom-designed "secret weapon" will make you look like a master mentalist in minutes! "As real as it gets!" "This fooled me entirely! I'm an instant fan and want to do it asap!" "You fried me, I want to put this in my repertoire immediately!" "I love being fooled! How do I put this in my next TV special?" 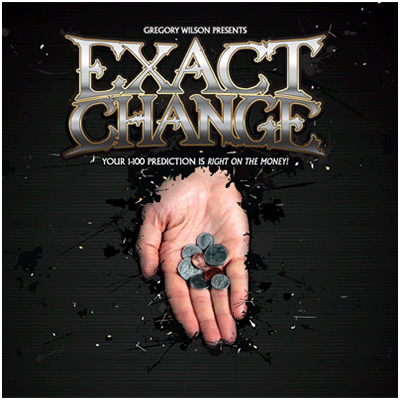 Note from Gregory Wilson: So far, Exact Change can be done with US and Canadian coins only. With a clever make-shift idea by Jon Allen, the effect can also be done with English and Euro coins. Warning: Used for entertainment purposes only. Not intended for con artistry or cult worship. Any resemblance to real witchcraft is purely coincidental. User shall assume all risk and responsibility in connection with audience's mental safety and well-being.